Lugging logs in from the cold all winter, tending to a fire and cleaning out the fireplace are all things of the past with this Ponderosa log set. These exceptionally realistic logs are molded from Refractory Ceramics. Wood grain and bark detailing is then hand painted by the artisans at Empire. The matching vent free Slope Glaze burner provides 32,000 BTUs of supplemental heating power to quickly and efficiently heat your space. Ceramic beads inside the burner tumble the gas to create remarkably realistic flame movement. The Slope Glaze burner pilot can be controlled directly via the controls on the burner. For safety, an Oxygen Depletion System will shut down the burner if the oxygen levels become unsafe. All gas log sets from Empire Comfort Systems are designed and tested to ANSI standards. Empire proudly manufactures their Gas Log sets in the USA. This set features a manual safety pilot valve with a variable flame height control knob. Minimum Front Width Required 32"
Empire’s Ponderosa gas log set is one of our most popular ventless gas log sets. Say goodbye to the hassle of real wood but still keep the ambiance of it in your space. Its split wood design mimics the look of fresh kindling and has wood grain and bark details that are hand painted by artisans at Empire. Made of refractory ceramics, this gas log set is high quality and made to last longer than sets you would find in a big box store. Empire’s Slope Glaze burner has small ceramic beads inside that help move the gas around to make the flames look more realistic, like a natural fire. This burner efficiently and quickly heats your room making this set a good heat supplement for your home. Because this is a ventless gas log set, you must keep the gas logs in the factory-determined placement. Empire’s Ponderosa comes in numerous ignition methods including models with wall switches and remote controls. These are perfect for those with mobility issues or anyone wanting the added convenience. If you’re not sure what size you need, use our gas log calculator or reach out to one of our gas log experts at 877-387-1177. 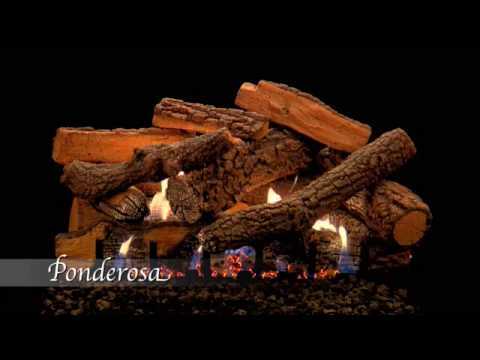 See the Ponderosa Gas Log Set in action. Does the 24-inch Ponderosa Ventless Gas Log set offer the on/off manual button that sits inside the firebox? I understand that I can keep the pilot lit at all times or turn it off after each usage; is that correct? This set does contain an on/off manual control that sits inside the firebox that is used to light the pilot. The pilot can be kept lit or turned off after each use. 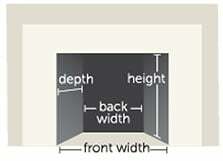 In the picture the set includes the grate. Is the grate a part of the set? Yes, the grate is part of the set. Can this be used purring a power outage? Yes, the remote system is battery operated.